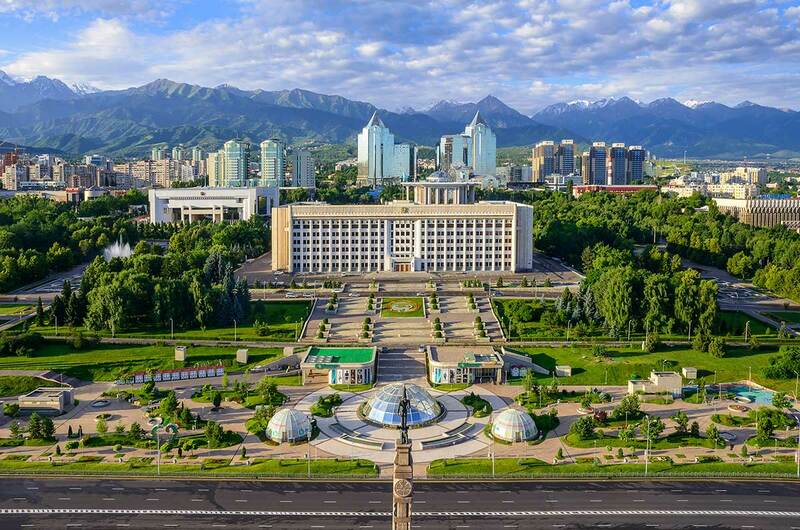 Almaty is a classic city of contrasts by its nature. Almaty is a classic city of contrasts by its nature. Because it is located exactly on the verge of two diametric geographic elements. The greatest mountainous region in the world which stretches from here to the Himalayas and breaks off to the sultry Indo-Gangetic Plain without really descending anywhere on one side. And the boundless plain of the Great Steppe continuing through the West Siberian Plain to the icy Arctic Ocean on the other. At the same time here, on the Almaty verge, the tropical heat and the arctic cold are at a seeing distance. In summer, from the city streets of the megalopolis you can see the hot deserts and, at the same time, non-melting glaciers. It is important that this verge is not smeared on the map. On the contrary, the ridge of Zailiysky Alatau crowned with glaciers rises sharply above the city to a height of four kilometers. Generally speaking, this is a rather rare phenomenon on Earth. Usually, the peaks of high mountains and plains are separated by such a long strip of foothills that it is not just difficult to descry high Alpine peaks from the foot, it is impossible to do so. “Nowhere in Eurasia I managed to see the higher mountains so close, since in the Swiss Alps, in the Caucasus, in Turkestan and even in the higher Tien Shan the giant snow crests are visible only from high absolute altitudes and nowhere they reach a height of 4,000-4,500 meters above the spectator that has the ridge of the Zailiysky Alatau directly rising above the Ili Lowland”. The testimony of the father of Russian geography is priceless! But in Almaty the geography is not just contemplative but visible! If you climb to an upper part of the city (to the level of Satpayev Avenue) and stand in the alignment of some city street running from south to north on a nice and clear day (ideally after a night of rain), then there will appear an amazing picture that is impossible in any other place on Earth. In the north, beyond the city outskirts as far as your eyes can reach, there will be only a boundless flat plain ending in a straight line of the horizon. And to the south your view will be obstructed with the grandiose arête of the Zailiysky Alatau in all its beauty. But let’s stop swinging back and forth. The East does not like fuss. First, let's look to the North. What is that yellow massif that can be seen behind the Almaty city blocks and the green strip of suburban fields? Oh, that is Moiynkum a real sandy desert, framing the dry Karoi Plateau from the East. The Moiynkum sands stretch along a narrow strip across the Kaskelen River and abut the Kapchagay Reservoir. It is about 25 kilometers from the city center to this desert. And it will be a big mistake not to believe in the seriousness of Moiynkum. 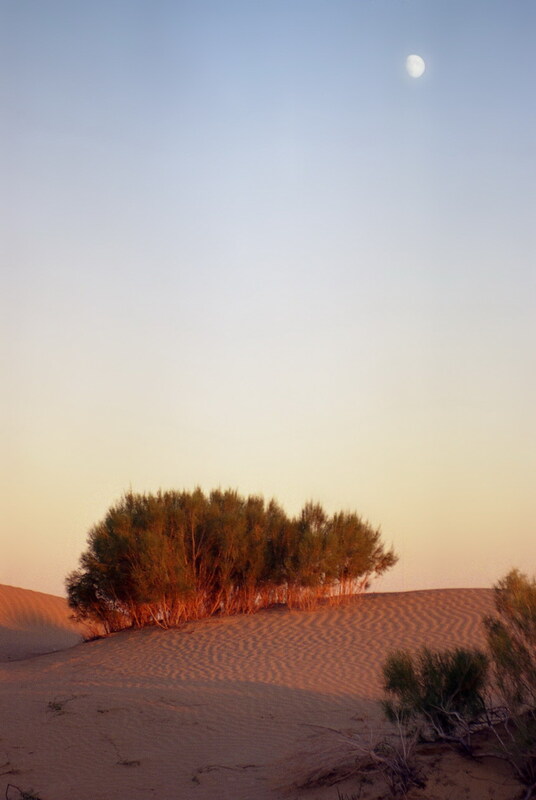 There is everything that should be in a real desert (except, perhaps, camel caravans). There are barchans, saxaul bushes, intolerable heat, sandstorms, turtles, snakes, and djinns! And now let’s turn 180 degrees to the mountains. And what is it there so blindingly shining on the tops of the mountains in the rays of the midday sun? These are real mountain gletchers of glacial groups in the upper reaches of the Malaia Almatinka and Talgar rivers! The hundreds of meters thick and several kilometers long glaciers cover the sky-high valleys and hang down from alpine peaks. And they have everything that these beautiful and dangerous arctic agents are famous for: bottomless cracks, ringing streams disappearing into the ice gaps, water basins into which the ice chunks are falling each and every minute, and disturbing polar spirit emanating from thawed ice. That distance to these glaciers is the same 25 kilometers. Here the ice and the flame are only 50 kilometers apart. And the most of the space in between is taken by the city streets and buildings. The seven-league boot may be left at home. Thus, in our city there is a fairy-tale transformation of the principles by which the earthly nature lives. The latitudinal zonality changes places with altitudinal zonation. And if to the north the way from the desert belt to the eternal ice of the Arctic Region stretched for several thousand kilometers (across steppes, forests, taiga, tundra), to the south the same way (through all the same areas) shrank to the distance of immediate reach! And this is the reason for the unique recreational peculiarity of Almaty which cannot be found anywhere else on Earth. Only here anyone who wishes to do so can pass through and see everything that lies between the hot desert zone and the cold arctic region in just a few hours. Going all the way ... by public transportation! The phenomenally advantageous location of the Metropolis provides unique opportunities in terms of development of mountain sports, tourism, and various types of outdoor activities. For example, our mountain climbers walk to many of the adjacent four-thousanders like for an ordinary Sunday walk in just one day. In Almaty there is such an endemic sport as weekend mountaineering. That is, theoretically, any brave casino visitor in Kapchagay (a satellite city on the edge of that very Moiynkum Desert) can go to the mountains early in the morning (light handed!) after a night of gambling, and reach the top of the Abai Peak (4,010 m) (single or double) and descend into the city in the evening with the feeling of a great accomplishment, and then blow off steam in some nice little restaurant, you can find a legion of those in the Megapolis. You have to agree that this is too cool! But the nature gives us this option! Why shouldn’t we use it? 1. The lake at the Bogdanovich Glacier, one of the closest to Almaty. 2. Barchans in the Moiynkum Desert. 3. Apricot blossoms is blooming on the background of snowy mountains. Almaty picture. 4. The city view from the nearest Kok-Tube hill panorama. 5. The Alpine peaks are seen from every place in Almaty.